Image caption Bhàsaich Mgr Mandela oidhche Dhiardaoin, aois 95. Tha am fear a bha os cionn na strì airson democrasaidh a thoirt gu Afraga a deas, Nelson Mandela, air bàsachadh. Bha Mgr Mandela 95 bliadhna de dh'aois, agus 's e a' chiad cheann-suidhe dubh a bh' air Afraga a Deas. Chaidh naidheachd a' bhàis fhiollseachadh le Ceann-suidhe Afraga a Deas, Jacob Zuma, anmoch oidhche Ardaoin. Chuir Mgr Mandela 27 bliadhna seachad ann am prìosan air Eilean Robben, faisg air Baile a' Chèap, airson a' phàirt a bh' aige anns an t-strì airson còirichean a thoirt do dhaoine dubha ann an Afraga a Deas. Thathas ga fhaicinn mar an fhear a thug riaghaltas fo shiostam Apartheid, fo an robh mion-shluagh geal a' cumail smachd air a' mhòr-chuid de shluagh na dùthcha, a bha dubh. Bha mòran riaghaltasan air feadh an t-Saoghail ga choimhead mar cheannarcach ri linn rudan a rinn am pàrtaidh aige an ANC. Chaidh a dhèanamh na cheann-suidhe air an dùthaich ann an 1994 - a' chiad cheann-suidhe dubh, agus a' chiad cheann-suidhe a chaidh a thaghadh le muinntir na dùthcha air fad riamh. Tha ceannardan poileataigeach air feadh an t-Saoghail air luaidh a dhèanamh air. Thuirt Ceann-suidhe Afraga a Deas, Jacob Zuma: "Tha ar nàisean air a mhac a b' fheàrr a chall, agus tha ar daoine air athair a chall. "Ged a bha fhios againn gun tigeadh an là seo, cha eil dad a lùghdaicheas am faireachdainn trom, leantainneach annainn gu bheil sinn air call gu mòr." Thuirt Prìomh Mhinistear na h-Alba, Ailig Salmond, gun robh Mgr Mandela "air a bhith na threòiriche do na milleanan gun chunntadh." Tha solas soilleir air a dhol às san t-Saoghal. Thuirt Prìomhaire Bhreatainn, Dàibhidh Camshron: "Tha solas soilleir air a dhol às san t-Saoghal. 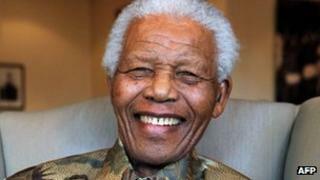 "B' e laoch mòr ar linne a bh' ann an Nelson Mandela. Dh'iarr mi gun cuirear am bratach os cionn No.10 aig leth-chruinn." Thuirt a' Bhàn-righ Ealasaid II gun robh i "brònach dha-rìribh" aig an naidheachd. "Dh'obraich e gun sgìths airson maith a dhùthcha, agus 's e a dhìleab an Afraga a Deas sìtheil a chì sinn an-diugh," thuirt brath oifigeil bho Lùchairt Bhuckingham. "Tha a Mòrachd a' cuimhneachadh le blàths mòr a cuid choinneamhan le Mgr Mandela, agus a' cur a cuid cho-bhròin a dh'ionnsaigh a theaghlaich, agus mhuinntir Afraga a Deas aig an àm bhrònach seo."